I designed a coloring book, bookmarks, and the Amazon Webstore for Treasure Hunt in the Enchanted Forest, the book I illustrated. The bookmarks are coin-themed. Each bookmark design features a different kind of special coin (like the War Nickel) along with a character from the book, and facts about the coin on the back of the bookmark. Inside the book, there’s a different activity on each page, and the children can apply what they’ve learned from reading the book. Also, recently I participated in my first ever craft fair – the holiday gift fair at work. It was so much fun setting up my booth and I met lots of new people! Here is a picture of my booth. 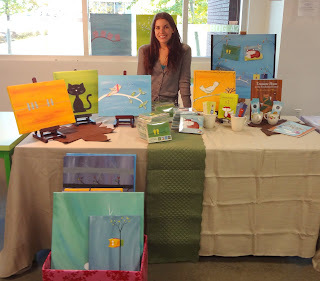 I had little easels with small paintings on them, and the rest of my paintings in a box in front of the booth. I also had packs of cards and my bookmarks, and a copy of the book I illustrated. The greeting cards are what sold the most! They went so fast. I already have plans for a new set of greeting cards, so I’m already excited for the next craft fair, whenever that may be!